To kick-off the season of making New Year's resolutions, Baskin-Robbins® is ringing in the New Year with the introduction of BRight Choices treats. 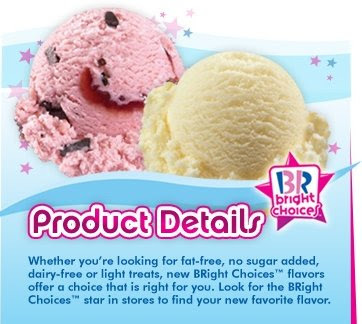 BRight Choices are better-for-you light ice cream options including fat free, dairy free, no sugar added and light ice cream offerings -- all the great taste but with less guilt. The pink star on Baskin-Robbins' products indicates a BRight Choices flavor. Baskin-Robbins is celebrating with BRight Choices Day on January 15, 2009, when participating Baskin-Robbins shops nationwide will offer a free BRight Choices scoop to any customer with proof of a gym membership.